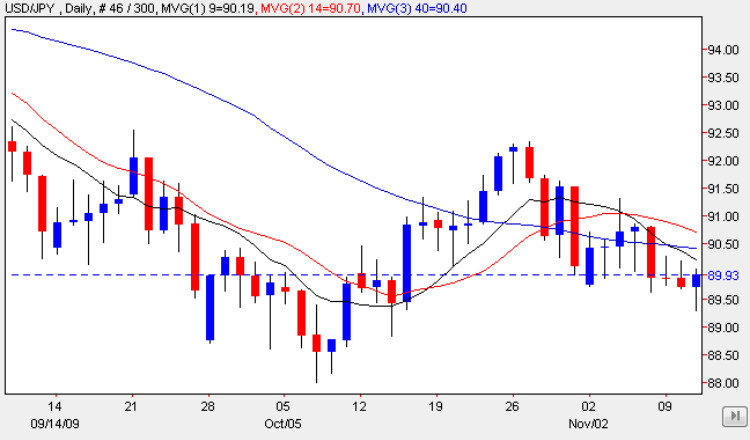 The yen to dollar pair continues to grind lower as we now begin to approach the 88.50 price level where the previous move found some support for a bounce higher, and it would come as no surprise, given the Bank of Japans interventionist approach to its currency, to see the same price action occur once again in due course. Indeed yesterday’s candle which closed as a small hammer on the daily chart suggests that we may see a small bounce in the next few days, with the low of the day finding a potential platform from the support area immediately below. However, with all three moving averages pressing heavily downwards on the daily chart this is far from certain, and only a break and hold above these technical indicators, coupled with a breach of the $92 price level will confirm this analysis. We could also be seeing the start of a double bottom formation on the daily chart – far too early to confirm this at present, but nevertheless and interesting pattern which could be developing and which would signal a strong move higher in due course. The only item of fundamental news to come out of Japan’s was producer prices which came in at -6.7% against a forecast of -6.0% and falling again for the 10th month in a row. Meanwhile in the US the unemployment claims are due along with crude oil inventories. In addition there is a press conference from Treasury Sec Geithner while on a visit to Singapore.